Word problems are a great way to see the real world applications of math! In this tutorial, you'll see how to graph multiple inequalities to find the solution. Take a look! How Do You Graph a Greater Than Inequality on the Coordinate Plane? 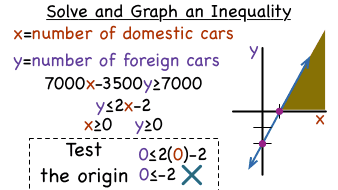 Graphing inequalities on the coordinate plane is not as difficult as you might think, especially if you know what to do! In this tutorial, you'll see the steps you need to follow to graph an inequality. If you graph an inequality on the coordinate plane, you end up creating a boundary that cuts the coordinate plane in half. Each of these halves is called a half-plane. Learn about half-planes by watching this tutorial! What's a System of Linear Inequalities? A system of equations is a set of equations with the same variables. A system of inequalities is almost exactly the same, except you're working with inequalities instead of equations! To solve such a system, you need to find the variable values that will make each inequality true at the same time. This tutorial will introduce you to systems of inequalities.